This tragedy is leading me straight into the arms of today’s feel-better post about cozy, wintery foods you can make with a Dutch oven. Maybe cold times are not so bad after all. Just, I’m learning, okay? Sometimes it takes me a while to come around. And in this last year, I have most definitely learned about the delicious wonders of the Dutch oven. It is my most used (and cutest) piece of cookware, hands down, and it only cost me $50 at Target. If you’ve never owned a Dutch oven before, let’s define. A Dutch oven is thick-walled (usually cast iron but also ceramic and clay) cooking pot with a tight-fitting lid. Thank you Wiki. It’s also a vessel that makes extremely delicious food easier to make because it’s sturdy enough to go from stovetop to oven. YAAAAS. 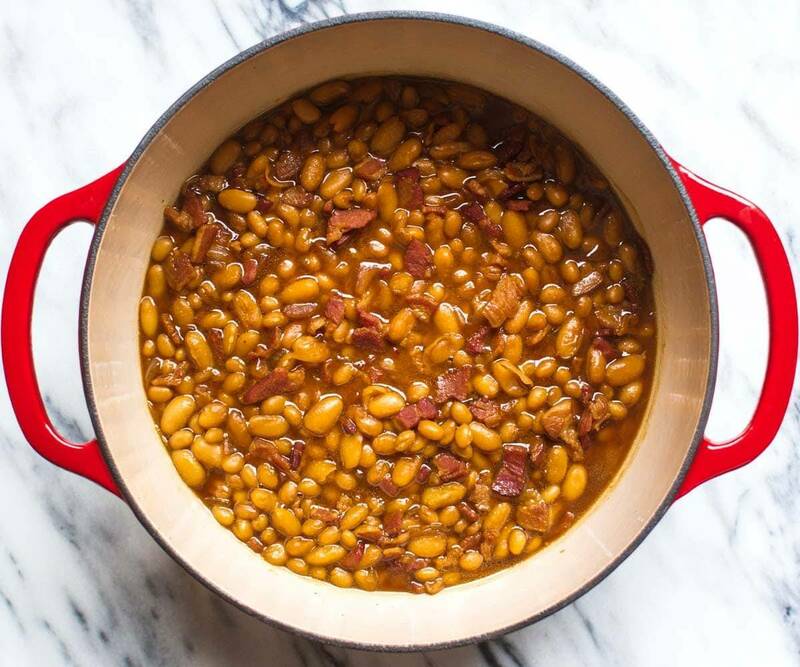 I have only ever owned the Lodge Dutch oven (I have the 6-quart red version in red which is pictured here) and I highly recommend it as a low-risk, affordable, high-quality first go-round at the whole Dutch oven situation. It is ultimate coziness in oven-proof cookware form. After using my little red $50 Lodge Dutch oven for the last year and realizing that, yes, indeed, the Dutch oven is worthy of its place in my kitchen, I am confident that I will have no future need for buying the more expensive versions. I mean, God bless those dreamy Le Creusets – they are super fun-looking and I’m sure they work wonderfully – but for me, the Lodge Dutch oven was the perfect in between for my competing Wants-a-Dutch-Oven and Doesn’t-Want-To-Spend-Hundreds-of-Dollars goals. Check out the listing on Amazon – it has a 4.7 star rating from 3,500 reviews. Or if you’re a brick-and-mortar type shopper, like I sometimes am, you can also grab this baby at Target in the cookware section. I’m not even sorry to say that literally bought my Dutch oven FOR THE BREAD (scroll for details), and served the bread to my friends at dinner club, and had one friend who went home and ordered one for herself (for the bread) and one friend who put it on her Christmas list (for the bread). And in bringing it full circle, the recipe for the bread listed in this post is from one of the friends in my dinner club. It’s a dinner club slash bread lovers anonymous. 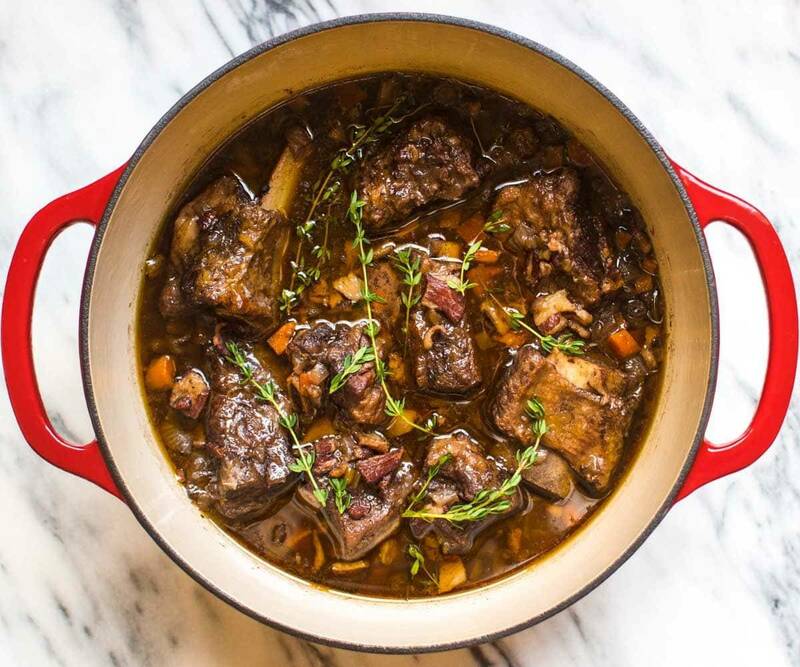 Why the Dutch oven works: Braised meat is perfect in a Dutch oven because you’ll sear the meat to get it brown and seal in all those juices, and then transfer it to the oven for several hours to get it all tender and wonderful, but you can keep it all in the same pot the whole time. Lazy girl win! Orrr in laypersons terms, IT JUST WORKS. And it’s really, really good. This recipe alone is the one single reason I decided to finally buy a Dutch oven. Why the Dutch oven works: You start this recipe by browning the bacon, but then you finish it off in the oven. One pan! Glory be. This guy needs to bake for quite a while, especially if you end up using dry beans, so being able to just leave a nice heavy duty pan in the oven for that long is really awesome. Why the Dutch oven works: It gives you the functionality of a saute pan to start the vegetables and brown the meat AND the functionality of a slow cooker because you can just continue to let it simmer away all the live long day. It’s super heavy duty and it just begs for recipes that require long cook or simmer times. Why the Dutch oven works: Who knew?! An oven heats from every direction as opposed to the direct heat from a stovetop burner, which means it’s actually much easier to get the sauce to reduce gently in the oven, and it requires only a few stirs here and there – three cheers for that. Plus the top gets a little bit browned in the process which adds some really rocking flavor to this sauce. 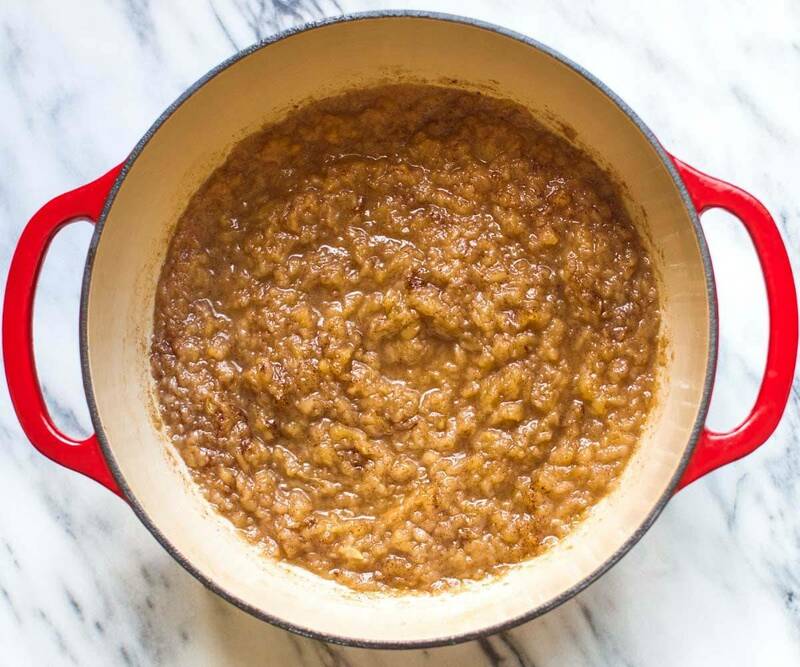 Why the Dutch oven works: This amazing hack gives you homemade applesauce with an almost completely hands-off approach. It holds a large amount of apples, cooks them down evenly, and gives you the most beautiful homemade applesauce. Win. Note from recipe tester Kristin: I used this recipe as written but then added in chicken at the end for my meat eating family. 😊 It was so easy! Why the Dutch oven works: It perfectly fits a chicken, and because it gets so hot on the sides , it helps roast it evenly on all sides of the chicken for awesomely crispy skin. If the skin browns too quickly on top, you can place the cover on to help avoid direct hot heat. But you know I liked that ultra browned skin. Look at us, making whole roasted chickens! Note from recipe tester Kristin: I used this post for additional instruction with the timing and temperature for roasting. 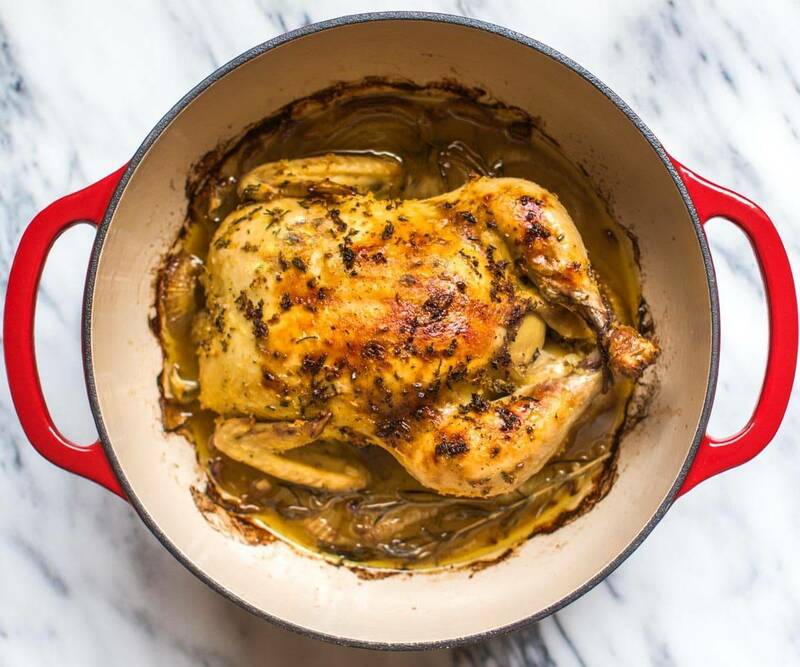 Why the Dutch Oven works: You can roast the chicken in there and then keep all the juices from the chicken in the pot as a base for the stock – no need to clean the pot after roasting the chicken! Party. 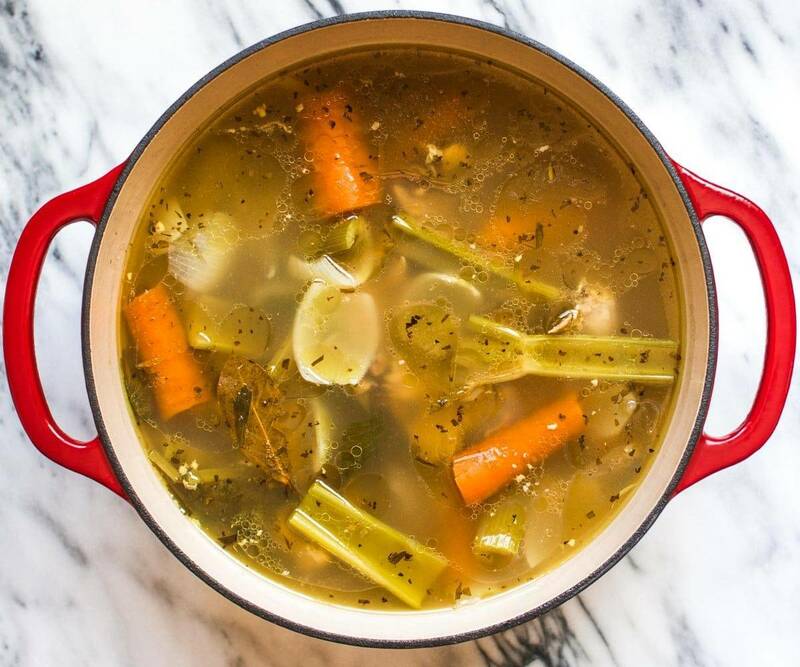 The Dutch oven also stands up well to long periods of heat on the stove, which is part of the deal when you’re making stock. Note from recipe tester Kristin: I used this post for additional instruction as well. Why the Dutch oven works: Start it on the stove, end it in the oven. So simple. Are you noticing a pattern here? When we went Up North last week, I only brought one pan with me and you better believe it was the classy red Dutch oven. It’s like a part of the family now. For the love of all things delicious and especially that NO KNEAD BREAD, you must at least investigate your options for this super versatile piece of cookware. Here’s the listing to the one that I have on Amazon with more than 3,500 reviews for your research purposes. I love me some Amazon reviews. Disclaimer: This post contains affiliate links for the red 6-quart Lodge Dutch Oven. I’m in love with this post. My mom offered to get me a bigger Dutch Oven for Christmas but the Le Cruesets are a mortgage payment or two and I didn’t want to use my whole budget on that. I’m heading to look over this Lodge right now and am excited about your suggestion. Red is the color of my choice too! Gorgeous. I’ve made tomato sauce in my D.O. but applesauce. I LOVE that idea and will set to work on that today. I actually have 2 apple trees in my yard which are thriving this year. GREAT post. I love the price of the Lodge. Oh and have you ever made popcorn in your Dutch Oven? I don’t have a popcorn maker and wanted to make popcorn and watch the new Cinderella movie with the fam, but that bagged stuff in pretty much cancer in a bag. It worked wonderfully. Ok, it’s off to Amazon for me, gotta order my Halloween costume anyhow (Snow white this year.) Thanks!!! Love the idea of popcorn! Thanks Laura! I love making popcorn in my Dutch oven. I prefer using coconut oil because of the high smoke point. I add a little coconut oil to the Dutch oven. Once it’s aromatic, I drop in 3 or 4 kernels of popcorn and cover it. When I hear that they’re starting to pop, I pour in the kernels– just enough to make one even layer. I keep the Dutch oven over medium heat and shake shake shake every so often. When the popping slows down, I like to add way too much melted Kerrygold butter, salt, paprika, and sometimes a little garlic powder. 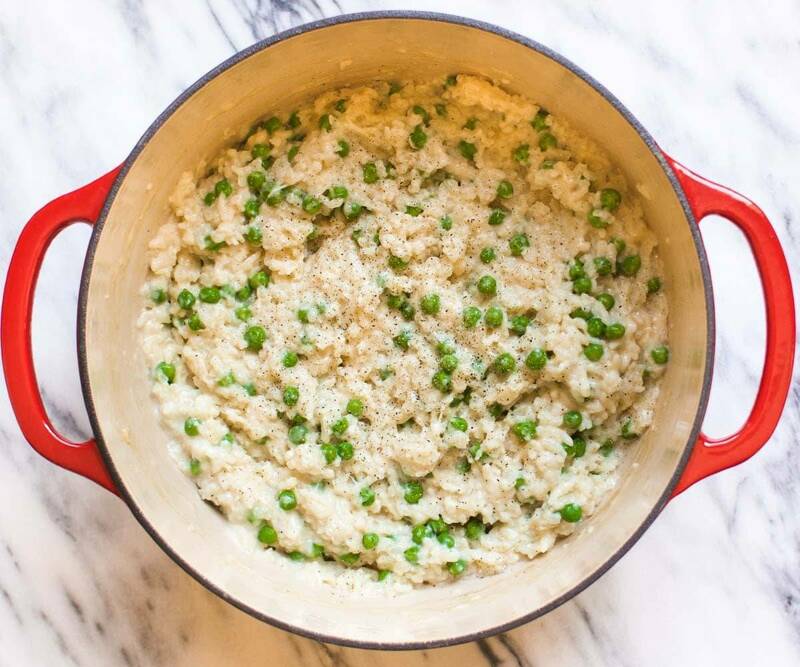 It’s really fun to serve this as a casual and friendly appetizer when friends come over! Thanks for your awesome post, from one Dutch oven fan to another. Anyone know how many pieces of charcoal to use to pop popcorn outdoors? What temperature do you pop popcorn at? Popcorn pops at 350 degrees. I‘be actually tested that. Just want to mention that I too could not afford a Crueset. So I ordered the Lodge from Amazon. Mine is sky blue and I absolutely LOVE my Dutch Oven. Just found this blog. Am loving it. Yesterday, I put two large porkchops in my Dutch oven, covered it with 2 cans of Cream of Mushroom soup, sprinkled a packet of Good Seasons Salad dressing mix over that, about 10 little mini potatoes unpeeled, and added 1/4 cup of water. My crockpot is broken, so improvised by using the Dutch oven. I covered the pan and put my heat on low. It took about 3-3.5 hours for it to turn into the most wonderful ever tummy-warming dish. LOVE this post! So many delicious things, so little time. Thanks so much for linking to my roast chicken recipe. It’s one of my favorites! I have a bright blue Cuisinart dutch oven- got it at Marshalls on sale 🙂 Also love the photos in this post- everything looks warm and cozy for the fall! Oh my gosh, you have really sold me on the dutch oven! I’ve wanted one but always hesitate because of the cost. But with all of this deliciousness, I think it ‘s worth it…especially if I go with a lower cost one like this. I take it a dutch oven is a saucepan. Not exactly. It is a cast iron (usually) pot than can withstand very hot temperatures. It can be used on a stove top (as a saucepan) but its true forte is in the oven. The density of the iron means it heats up well and maintains a steady temperature. An electric slow-cooker is actually a modern electric version of a Dutch oven when it is used inside the oven on a low temperature. Generally the Dutch Oven will have two small ‘grabbing’ handles on the side, not a long handle like my saucepans. Most Dutch Oven recipes could be cooked in an electric slow cooker, but the bread, which needs a very hot temperature, cannot be properly baked in a slow cooker. BTW the bread is worth it. I also bought my Dutch oven for the bread recipe. Ken Forkish has a great bread cookbook with many different French styled loaves cooked only in a Dutch oven. 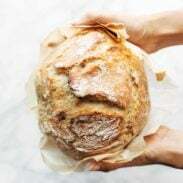 The process allows for the use of much less yeast, and it is the excess yeast that many older people react badly to in breads. Lindsay, I was gifted a beautiful dutch oven which is enamel on steel construction, not cast iron. Would I be able to utilize my dutch oven for your wonderful recipes? Especially the bread? I don’t see why not! 🙂 As long as it’s heavy duty with a heavy lid, and is oven safe, you should be good to go. I too love my Dutch Oven. With my cast iron skillet, this is such a versatile tool. I have made almost all the recipes you have shown here. It is definitely getting to be that time of year to use all of the functionality of the Dutch oven! Yay for fall ’cause I get to use my Dutch oven again! Thanks for the refresher on all its uses, it was just in time. So excited to try the bread – my husband is our bread-maker, but he’s always looking for new tricks. I’m lucky enough to have caught a sale and gotten a Le Creuset FRENCH oven in the most beautiful blue. (I wonder if it’s actually a different piece of cookware or if Le Creuset has something against the Dutch…) We set up a pot rack in the middle of our kitchen so I can display it prominently. It is my favorite piece of cookware and a nice kitchen decoration. 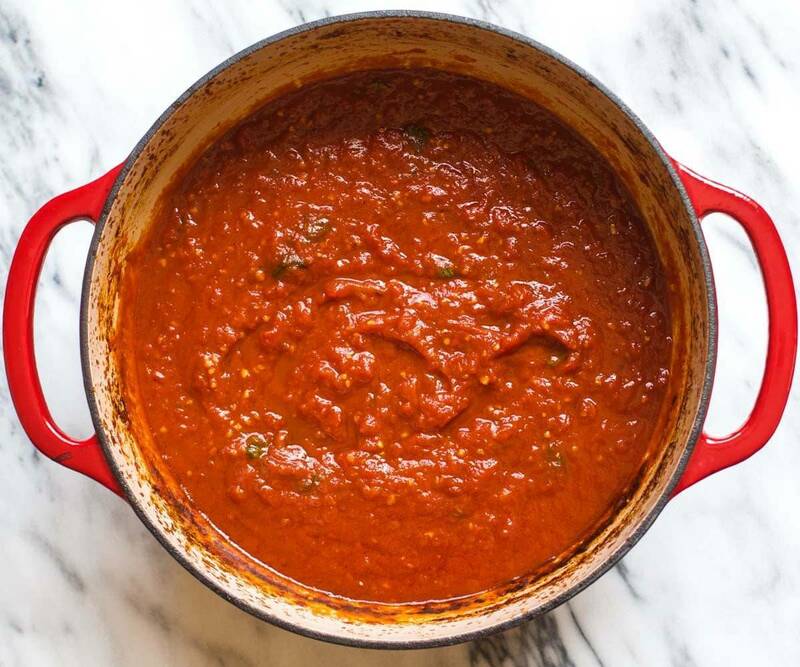 Btw, I see you used Kenji’s tomato sauce recipe – how awesome is Serious Eats? Are you getting The Food Lab cookbook? It’s on my Christmas list. I didn’t know it was called a French oven! Who knew. And yes – we love Serious Eats! I believe a French Oven is a Dutch oven with enameled coating. I use Lodge only. I LOVE THEM! I have a 4.6 and a 6 quart. Heavy but great. I use them on top of stove, in the oven and in my sun oven (solar oven) outside in the summer. So far no chips or cracks (some coated cast iron will do that). Have had mine for about 10 years now. Solar oven!? Linda, you are the real deal. Appreciate your posts and all the delicious recipes you have shared and I have tried a lot of them. Just a question about the lodge dutch oven…and I’m new to blogs so wondered if you are paid to advertise for them because it seems like an advertising tool today. That’s actually a great question Rose. I was not directly paid for publishing this post – whenever I AM paid directly for anything, legally it has to be disclosed at the top of the post. It will say “This post is sponsored by ___”. I have tried a lot of your recipes and I love them all! I haven’t been using my Dutch Oven recently and now it’s time to shake the dust off. P.S. I love the red color, it’s super-cute. Thanks Tania! Red is my fave too! I got a dutch oven for my birthday and I haven’t looked back. Awesome pot! Love this post!!! I got my Lodge Dutch Oven for Christmas last year (also in red!) and we just made chili in it this past Sunday. I loveeeee it. I love all the Le Creuset products, too, but unless you’re Giada, who can realistically afford those?! I also love my Lodge cast iron skillet. Great products! Ha! You crack me up. I FINALLY got a Dutch oven THIS year and have soo been wanting to make bread in it…this is definitely happening now that I have a great recipe to try! Love having these types of posts to refer to! You must try the bread! Hurry! 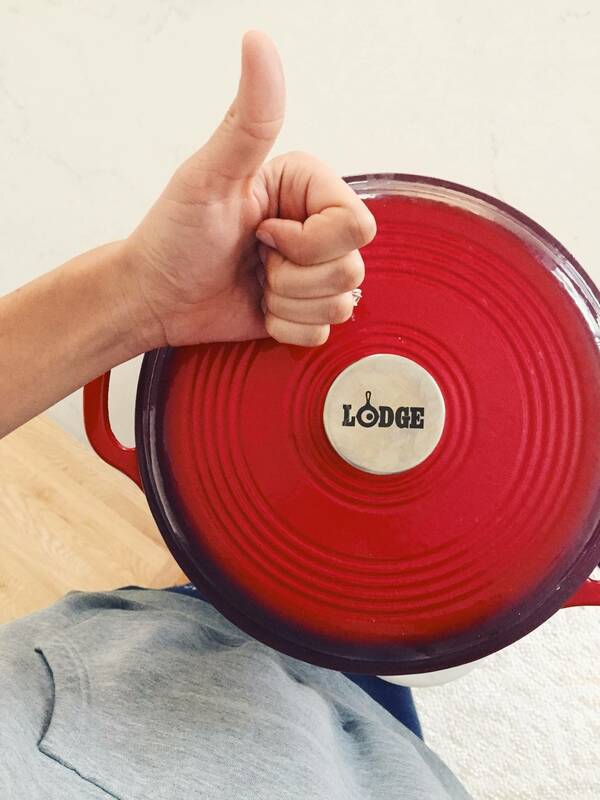 I have the exact same red Lodge dutch oven and love it so much. I mostly use it for soups, Mexican quinoa, and homemade ricotta cheese. That bread looks amazing! My hubby makes bread, but I may have to start using that method! Homemade ricotta cheese?! Do you follow a recipe? I’d love to learn. Welp you may have finally convinced me I need a dutch oven in my life. Now which color to get? I too have the red Dutch Oven! My favorite color. Everything always turns out great when cooked in a Dutch oven. I’ll have to get a Lodge piece. Oh and great recipe round-up! I have my eye on a few of them to make! 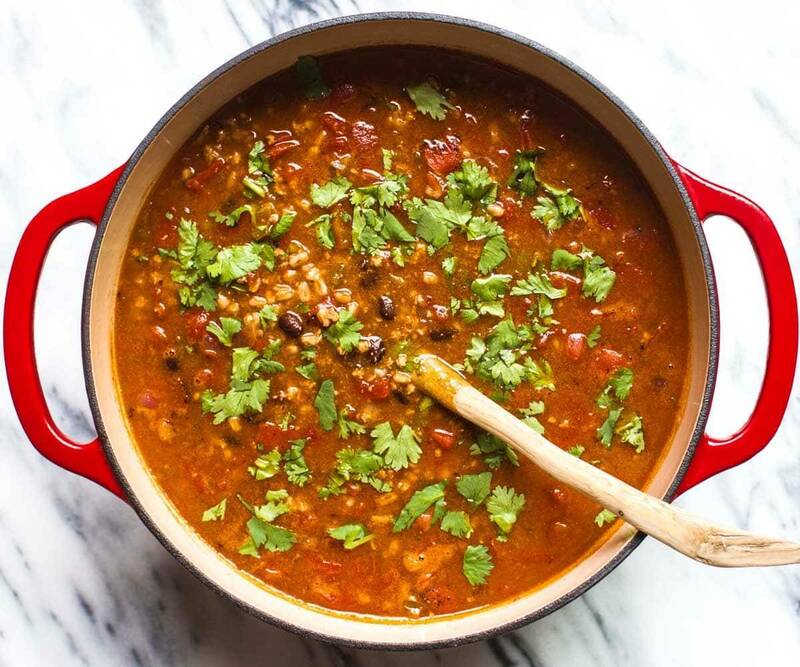 I absolutely love my dutch oven too–this post just makes me appreciate it even more! You’re right that it especially shines in fall and winter. My boyfriend makes fun of me because my dutch oven is my number one prized possession. Its a le creuset dutch that I got for a steal at TJ Maxx. I literally use it everyday. Great post! This totally makes me want to buy a Dutch oven right now at Target. I was dreaming of those expensive brands and have been saving up but the target brand is perfect for my budget. Will have to try al the recipes including the bread which terrifies me but that’s the fun part is seeing it work. If I can do the bread, anyone can! I am SO not a bread expert. Like, not at all. 🙂 And it turned out great! I have a very large, old cast iron Dutch oven (holds about two and a half gallons). Though I haven’t tried it yet, Alton Brown makes roux in a Dutch oven…imagine making gumbo but skipping that 45 minutes of stirring a roux. Thanks so much for sharing these recipes! I think the dutch oven is such a great and versatile tool to have in the kitchen. These meals all look so good, I can’t even decide which one is my favorite! Lindsay, I am finding your posts about how to use blenders, food processors, and dutch ovens really helpful! 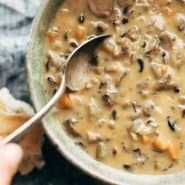 I have a dutch oven, which I LOVE, but I learned about some new ways that I can use my dutch oven after reading this post. Such as the bread, and a whole chicken. I never would have thought of those. I really appreciated your post on ways you can use a food processor. I bought the cuisinart food processor that you recommend and it has become my new fave appliance! There is no way I could every use any other food processor ever again. One day I’ll get a better blender ha! That seriously makes me so happy Emily! 😀 thank you! I’m totally envious of how the background/lighting/marble/etc are so identical in each of these photos! I’m majorly impressed, as always, by your food photography! 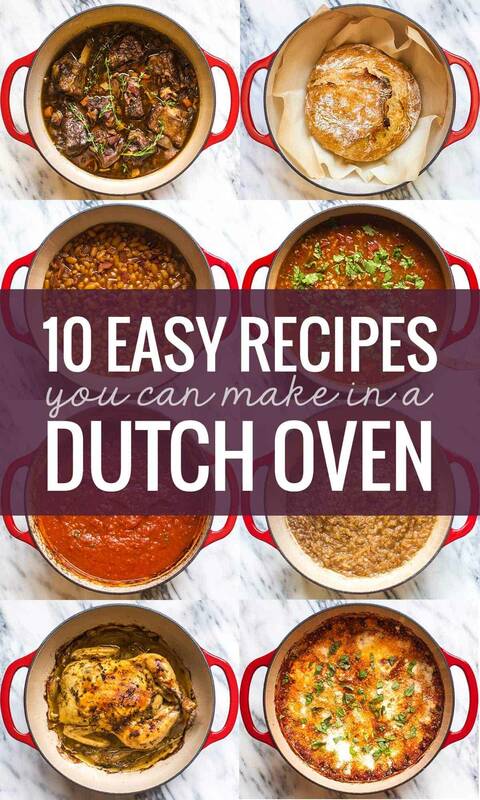 I’ve used my dutch ovens for years. Love them! I have the Le Creuset ones but we also have an outlet near by. I even have a Lodge dutch oven for camping….coals underneath and on top. Fun stuff. Those settlers and chuck wagon cooks knew a good cooking dish when they saw it! I made the no-knead bread in mine once but it made the inside all dark. I’ll have to give your bread recipe a try. Dang! Did you get the darkness out? We did parchment paper with ours. I have the same Lodge 6-Quart Dutch Oven! My then-boyfriend bought it for me for Christmas. Not unrelated: I married him. LOL – this is my favorite comment in a long time. You (and your then-boyfriend-now-husband) are awesome.